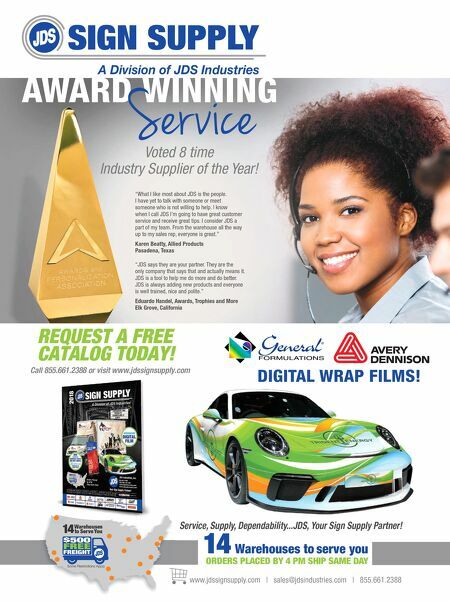 14 • WRAPS • 2 0 1 8 WRAPS INDUSTRY REPORT gees (98%), heat guns/lamps (96%) and prep cleaners (91%). Many shops use wrap magnets (85%), knifeless tape (82%), rolling stools (69%), and body gear (68%). Other tools mentioned but not listed included rivet brushes, edge sealers, plat- forms/scaffolding, ladders and weed burners. WARRANTIES AND CERTIFICATIONS Almost all shops (89%) offer some kind of warranty for the wrap work they com- plete. Of those shops offering warranties, most (56%) offer a combination warranty based on the lm manufacturer's warranty and a shop warranty. About 20 percent of shops offer warranties offered by lm manu- facturers, and fewer (14%) offer only a shop warranty. Installer certications for individuals and shops are growing in popularity, but many shops (48%) say they do not use certied installers—that's slightly down from last year when 50 percent of shops reported having no certications. Certications—for indi- vidual installers and for the shops themselves—are being earned from a range of certifying bodies currently available to the industry. It is important to note that criteria for installer certication vary greatly from certifying body to certifying body. The majority of shops report that continuing wraps education for installers is coming from online training resources (58%), in- dustry trade magazines such as WRAPS magazine (57%)—up from 49 percent last year—YouTube (55%)—down from 68 percent last year—trade shows (47%) and apprenticeships (25%). NETWORKS, SOCIAL MEDIA AND MARKETING Installer Networks—Installer networks are becoming more pop- ular in the industry as a way for wraps installers to extend their customer reach. Our report found that the majority of wrap shops (60%) do not have an afliation with an installer net- work, but that's down signicantly from last year (77%). However, about 37 percent of shops report that they would be likely or very likely to outsource to an installer network (up from 23% last year). Social Media Presence—Many shops looking for inex- pensive ways to market themselves turn to social media out- lets to establish a marketing presence on multiple forums. Nearly all shops (95%) report using social media outlets for business, and actively manage a Facebook account. Of those, most (66%), said that social media has led to an increase in sales over the last year. Shop Truck—Many wraps marketing experts agree that a wrapped shop truck is one of the most useful marketing tools available to a wrap shop. More than half (51%) of respondents say they update the wrap on their shop vehicle at least every other year (that's up from 42% last year). CONCLUSIONS Key ndings in this report indicate that shops continue to do well with wraps and that the industry itself is healthy and growing. By and large, shops are quite protable and the outlook is positive. Manu- facturers continue to offer viable products that shops need, and that make the wrapping process more efcient and the wraps themselves more durable. At the same time, shop owners are embracing new products and are participating in continuing wraps education. 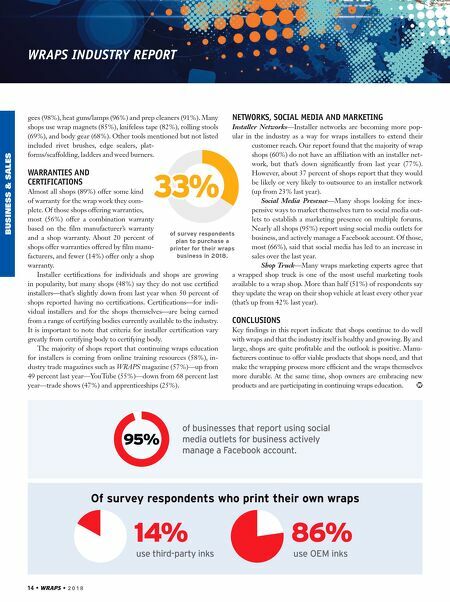 BUSINESS & SALES 33% of survey respondents plan to purchase a printer for their wraps business in 2018. use OEM inks 86% use third-party inks 14% Of survey respondents who print their own wraps 95% of businesses that report using social media outlets for business actively manage a Facebook account.